I was contacted by Rex Bonomelli of the New York Times Book Review to illustrate a review for two poetry books by the British poet laureate, Carol Ann Duffy. What made this assignment fun, was that the review was not particularly favorable to the author, so I got to add a little humor to the piece. 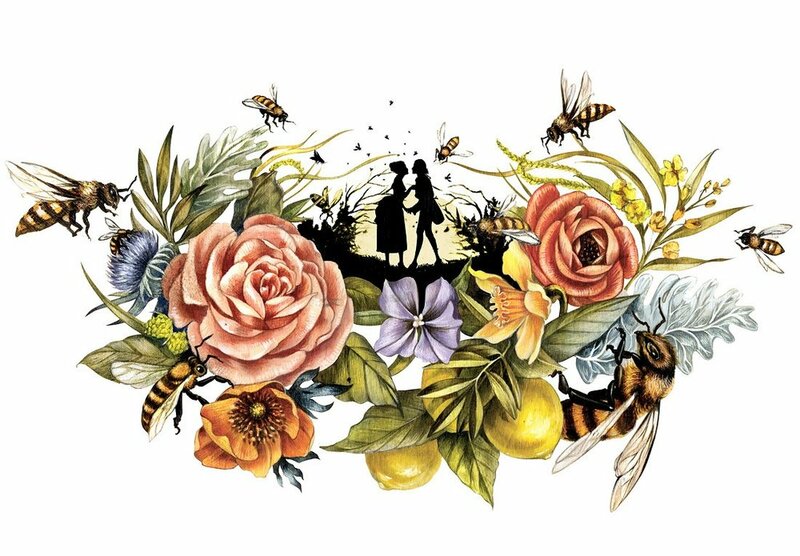 "Duffy’s new book, “The Bees,” has most of the tics of her love poems; but they don’t have the excuse of coming from someone intoxicated by a long swig of Love Potion No. 9. The poems are made no better by giddy lists of images ... and the mindless natter of Old English alliteration ... It’s one thing to be drunk on sound (or love, for that matter), another to let your style be nothing but its twitches.". I decided to create a classic image of victorian lovers in silhouette, surrounded by a sticky-sweet floral vignette. Bees buzz in the flowers, but at a closer look, the bees a little menacing are circling in towards the lovers as if to swarm them. This illustration was accepted into the 2013 Society of Illustrators Annual Exhibition.